The name “Hoi An” means peaceful meeting place – A beautiful city that was recognized by the UNESCO as a World Heritage Site, deserved to be a must-visit on any Vietnam Itinerary. 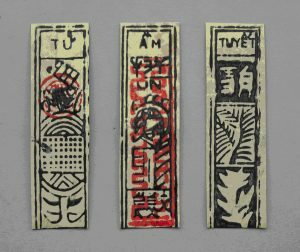 Tet (also called Lunar New Year) is shortened form of Sino-Vietnamese: Tết Nguyên Đán, which means “Feast of the First Morning of the First Day” that’s why Tet holiday is the most special and important celebration of Vietnamese People. For tourists who plan to stay in Hoi An, Tet is colorful, friendly and fun but a lot of stores will be closed during this Public holiday. But no worries, this actually is a good time to visit Hoi An We are happy to share with you the things that you can do on this holiday. In addition, you can easily get a chance to know more about the local lifestyle of people here. 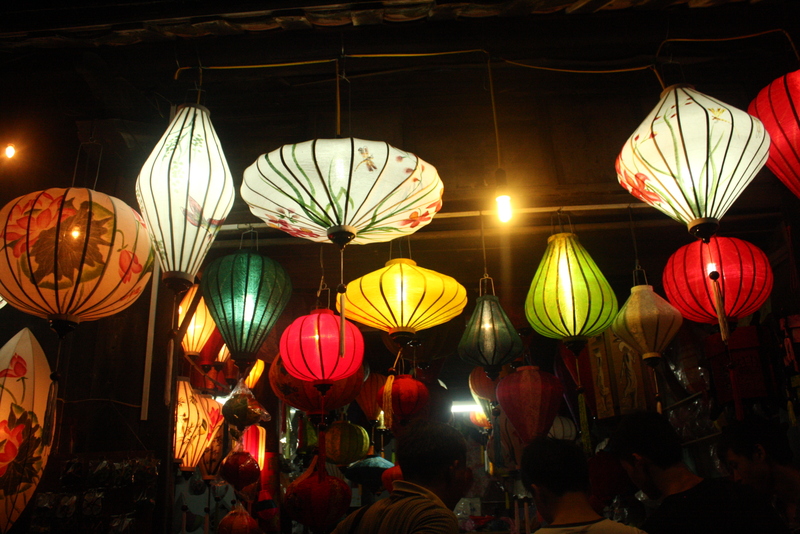 Hoi An Ancient Town is well-known by its lively colorful light of lanterns. Walking along Hoi An’s streets, you will be filled with feelings of tranquility, peace and happiness by the warm lanterns lights. It becomes more beautiful than ever during the New Year’s Eve. Hundreds of handmade lanterns at various sizes, shapes, and colors are lighted and hung everywhere on the streets, from little private houses to the ancient bridge, or leaved floating on the poetic river on this special occasion. The highlights will be the colorful lantern parade, free outdoor musical performances by visiting musicians and local schoolchildren, sparkling flowered candles on Hoai River, spirited lion dances all around Faifo to invite tourists to join the holiday. If you are a solo traveler, this is definitely time to make some friends and share the experience. During the holiday, whole country is on the move going home for the holiday and a lot of places close at this time of year but you should not worry about this as Blue Lotus’ Leather Workshop – one of top fun things to do in Hoi An still is open during Tet holiday. No extra fees added for the holiday season, Blue Lotus still remains the basic rate in order to offer the best experience for the guests. 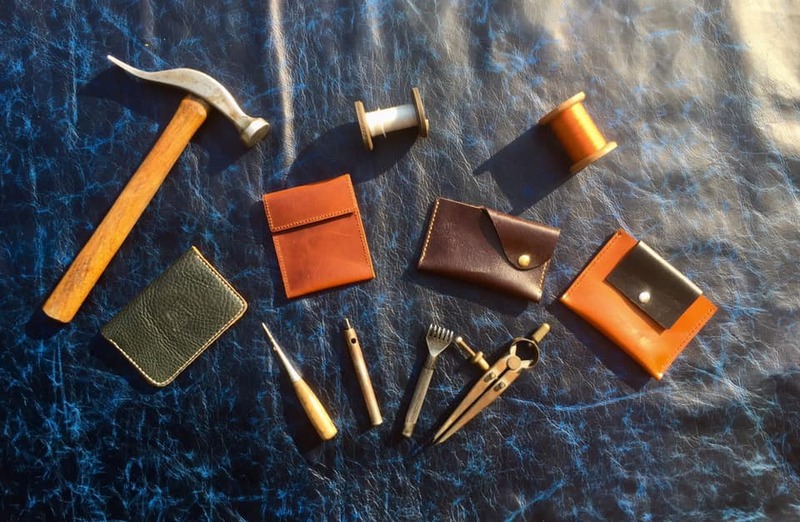 This could be you highlight of your whole trip, we’re happy to guide you to learn how to work with leather, design patterns and make your own leather goods that you can bring home for your family, friends and the loved one as a souvenir of Hoi An trip. All levels, all ages are welcome. “Banh Chung” and “Banh Tet” – are traditional and irreplaceable cake of Vietnamese people in the Tet Holidays and King Hung’s anniversary (10th March Lunar). 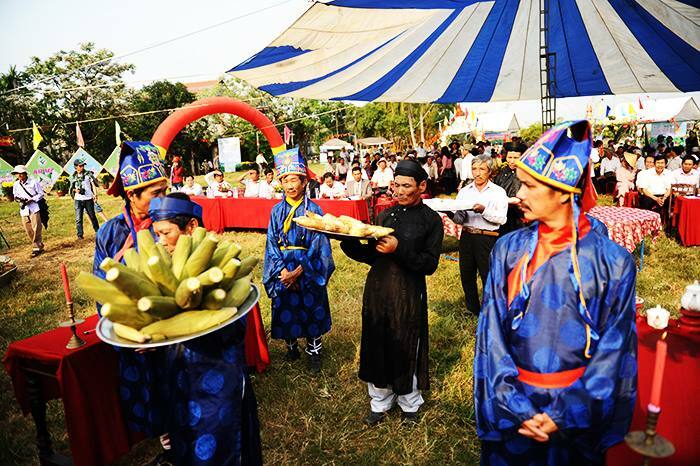 It’s easy to notice that people from the North will have the Chung cake while the Southern Vietnamese dedicate to their ancestors with Banh Tet. Banh Tet – the same ingredients with Banh Chung but is made with a different technique. For the Vietnamese, making “Banh Chung” is the ideal way to express gratitude to their ancestors and homeland. 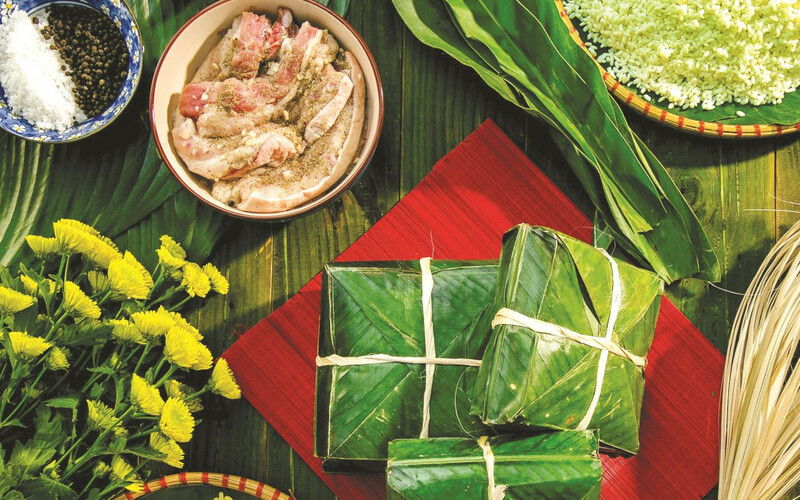 To immerse yourself deeply into legendary Vietnamese tales of Chung and Tet cake, the soul of Northern Vietnamese New Year. At this time of the year, it would be very meaningful if you try tasting this special gift of Lunar New Year. It has the scent of dzong leaves, slightly greasy from pork and nutty flavor of smashed green beans. It’s an explosion of taste! You are expecting an exciting, vibrant atmosphere for your trip? 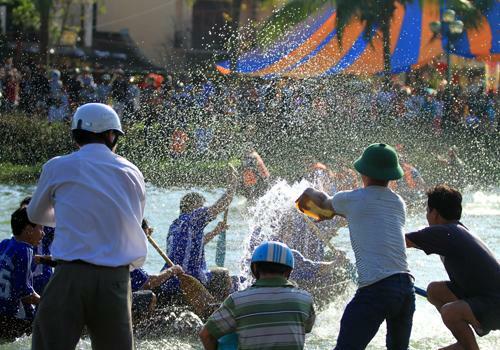 Do not miss the traditional boat racing which will be held on the Hoai River in the ancient town of Hoi An, Quang Nam province at 1:30PM on 10th February (on 2nd of lunar January). The boat racing festivals are organized in order to bring a cheerful atmosphere for people in spring. It is not only a competition, but also a ritual in honor of the Water God, stemming from the act of praying for water (common among agriculture-based people).. This annual event attracted more than 5,000 local people and international tourists. 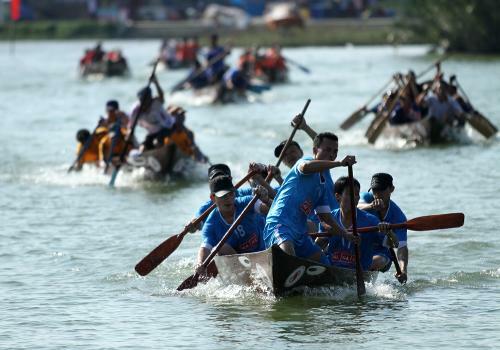 The boat racers were young people representing the wards of Cua Dai, Minh An, Cam Kim … of Hoi An city. Prepare to get sprinkled as people would throw water onto the boat racers to wish for good lucks. Before the festival, everybody in team work in the belief strength and the best wishes which the local people give to each other. 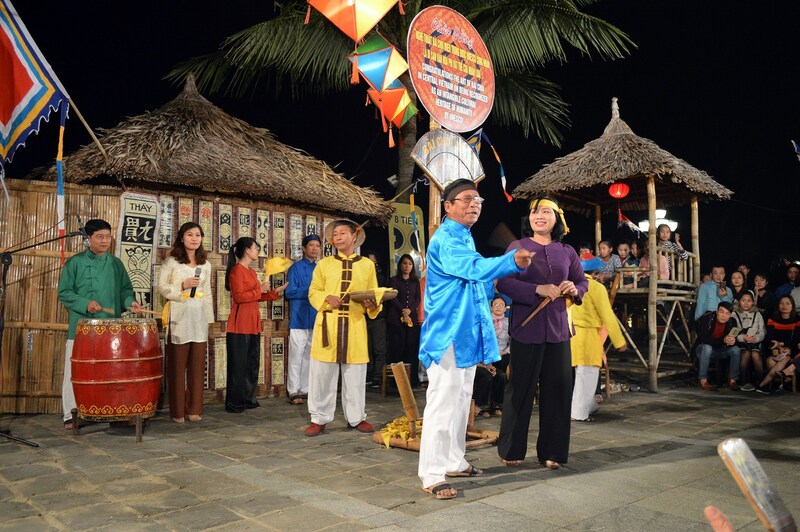 Proudly to be country’s 10th UNESCO Intangible Cultural Heritage, Việt Nam’s bài chòi (folk singing) is not only a game of chess but also a diverse art combining music, poetry, acting, painting and literature. This year of Pig 2019, on Feb 19th & 20th, “Bài Chòi” singing contest will be held at An Hội Sculpture Garden, promising the most unforgettable event for everyone that been here for Tet Holiday. The festival aims to promote local agricultural products of the Cam Nam craft village that has currently around 65 hectares of corn and 100 growing households. 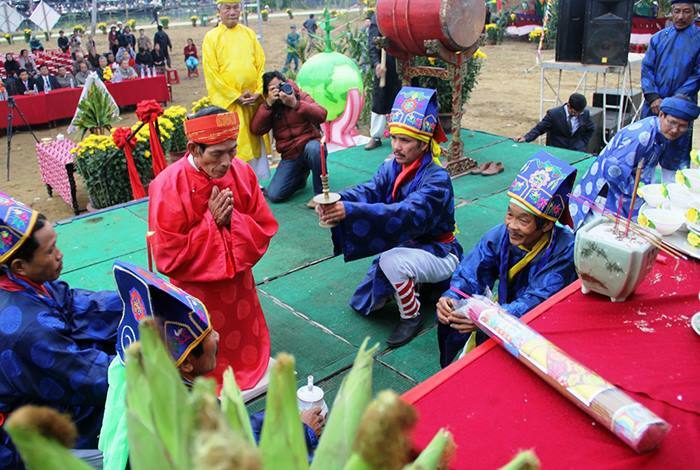 Visitors will have a chance to enjoy traditional rituals and ceremonies praying for a year of favorable weather and a bumper crop seasons, folk sport games, cooking show, art perfromances and others. 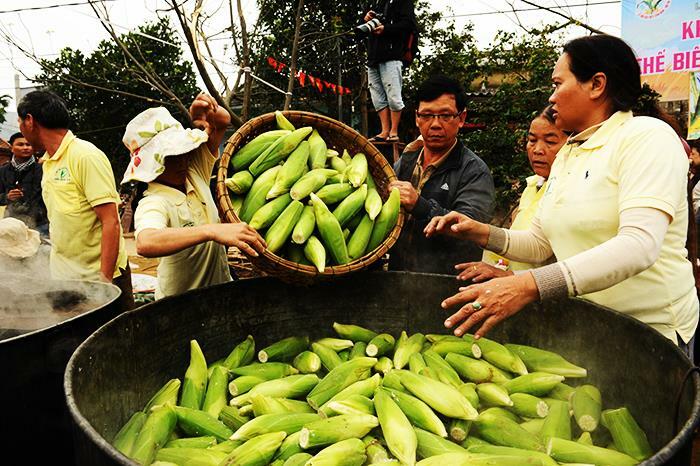 Over 7,000 sticky corncobs will be freely given to visitors in the festival. One of the most featured things to do of Vietnamese people when Tet is coming is to get their home some flowers, plants as a wish for their business in the following year to be flourish, blooming. Understanding this, Uy Ban ND of Hoi An decides to arrange a flower market along some main roads of the city. From 27th Jan – 4th Jeb, the city will be wearing a brand new festive coat for Lunar New Year. Immerse yourself in paths full of many beautiful flowers from the sellers and city’s decoration. 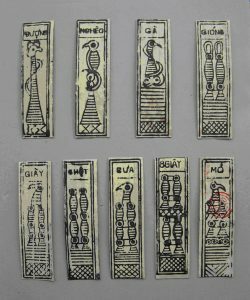 Trần Hưng Đạo st., Nguyễn Huệ st., Hoàng Diệu st., Nguyễn Trường Tộ st., Thái Phiên st., Phạm Hồng Thái st. and Trảng Kèo area. You can easily catch many lively scenes in every turns of Hoi An city from the local people getting ready for Tet New Year’s Eve. Very Vietnamese style! Furthermore, I believe any traveler wouldn’t miss a chance to know more about the peaceful place they are visiting, Hoi An. Hoi An has a reputation for being one of the prettiest cities in all of Vietnam and the Old Town here has been designated as a UNESCO World Heritage Site thanks to its 800 historic buildings. This small old town would make a perfectly delightful memory for your travel. 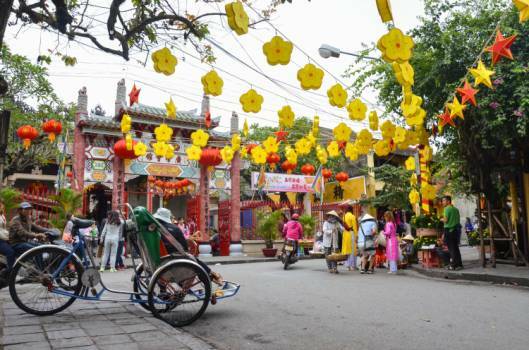 If you are going to Vietnam, remember to pay a visit to this charming city, especially on Tet. Enjoy your trip and happy new year!